Lisa on May 25, 2012 at 8:22 a.m. I don't really have any idea but I'd guess a stores that has toys and books relating to space. Can't wait to find out what it really is - the display behind the window looks quite intriguing! Sonja on May 25, 2012 at 9:46 a.m.
Joseph Iwaye on May 27, 2012 at 1:31 p.m. This look like a panoramic view of the galaxy brought to the earth. Ha ha haah! Hemanta on May 29, 2012 at 2:08 a.m. Tried so hard but really couldn't get what the pic is all about. So confusing...! Debbie on May 29, 2012 at 12:09 p.m. It's a not-so-secret front for a nonprofit writing center for kids. 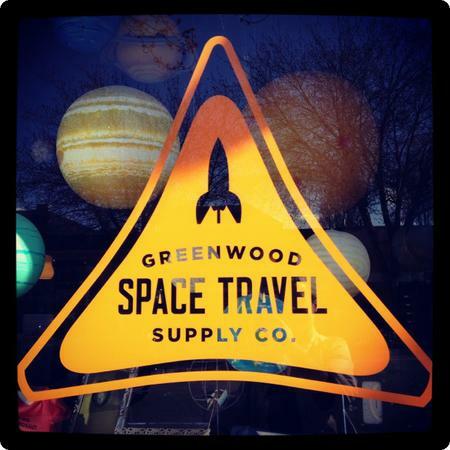 The front of the store sells all sorts of space-related items & some creative writing resources. Workshops are held in the back after passing through a secret door. The Pirate Supply Store in San Francisco, The Brooklyn Superhero Supply Co., The Echo Park Time Travel Mart in Los Angeles, The Boring Store in Chicago, the Greater Boston Bigfoot Research Institute, Ann Arbor’s Liberty Street Robot Supply and Repair, and the Museum of Unnatural History in Washington DC. Alex on May 29, 2012 at 1:32 p.m.
What a cool concept to get interest for a store! Never thought of something like this before. Thanks for sharing! Jenny on May 31, 2012 at 1:53 p.m.
Love your blog! So lovely! Ironhorsecb on June 12, 2012 at 10:29 p.m. I read your blog and found it very interesting and i achieve to learn a lot of knowledge from your blogs. Hannah Gibson on June 23, 2014 at 7:41 p.m.